iFlora® Multi-Probiotic® capsules contain 16 strains of probiotics (nine lactobacilli, five bifidobacteria, one streptococcus, and one lactococcus) that supplement natural flora colonies to promote digestive and immune health. This premier blend is one of the most diverse and plentiful probiotic products available, and works in both the small and large intestine to maintain a healthy balance of good flora that also supports a healthy urinary tract, maintains normal bowel function, and promotes healthy skin. All strains survive stomach acid for maximum effectiveness. 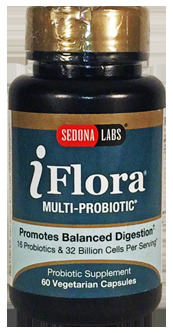 iFlora® Multi-Probiotic® capsules are manufactured by the Sedona Labs team in Cottonwood, Arizona. Sedona Labs takes special care to create a specialized, vegetarian, dairy-free and shelf stable product that works daily to replenish essential intestinal flora.